(CelebrityAccess MediaWire) — Apple iTunes continues to dominate the paid music download market, according to new data released by The NPD Group, Inc. Nearly 70 percent of music files downloaded legally between December 2003 and July 2004 were downloaded from iTunes. Napster's share for the same time period was 11 percent, while MusicMatch, RealNetworks and Wal-Mart each reached a six percent share. "Our research suggests that at this stage of the business it's not so much about building share as it is about creating demand for paid downloads universally," said Russ Crupnick, vice president of The NPD Group, Inc. "The overriding challenge for paid music download services is to first make the concept enticing to a wider audience and then to build loyalties to a specific service." 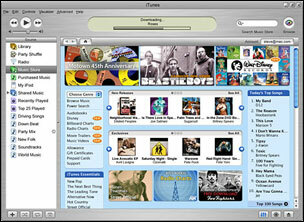 The number of consumers paying for downloads reached a peak of 1.3 million in April 2004. "Over the 18 months since iTunes launched, paid music download services have been hoping for huge increases in paying customers; however, the number actually doing so has declined to about one million users per month," said Crupnick. According to NPD, this downturn coincides with the end of promotional periods offered by several of these services, in which consumers were offered trial price incentives. "Building demand for paid music download services requires even greater investment in consumer promotion, as well as broadening partnerships with traditional music retailers and consumer goods companies," Crupnick said. "We've seen that promotion works, but it's had a short-term effect so far, which is typical for traditional consumer goods. The trick is in phasing promotions, so that there is a cumulative positive effect on the target market." During the past 12 months, households with a member using a peer-to-peer (P2P) site to download music for free has ranged from 4.7 million to 6.4 million per month, although NPD has noted generally higher levels since March 2004. The recent rise in P2P usage mirrors an overall increase in various digital music activities. Compared to the end of 2003, NPD has noted more digital music activity in a number of areas: consumers are more likely to rip music to their computers (9 percent in July versus 7 percent in December) and to burn music to CDs (14 percent versus 10 percent).